Surveys & Analysis--NEW REDUCED PRICE $24.99! NEW PRICE, JUST REDUCED: ONLY $24.99! 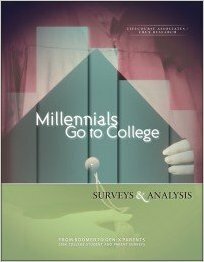 This exciting new research provides a comprehensive picture of the generational trends among today’s Millennial college students and their parents, and how your institution can prepare. Learn how the attitudes of Gen-X college parents differ from those of the Boomers who preceded them. Find out what Millennials want in a college and how they feel about the costs and opportunities of higher education.